Every now and then my wife and I talk about what we'd do if we had the money to build our dream house. 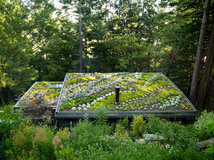 What things would we include beyond the normal spaces for eating, sleeping and such? 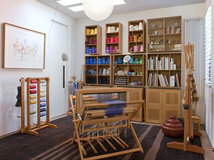 I'm always partial to a library, but my wife would love a pottery studio. 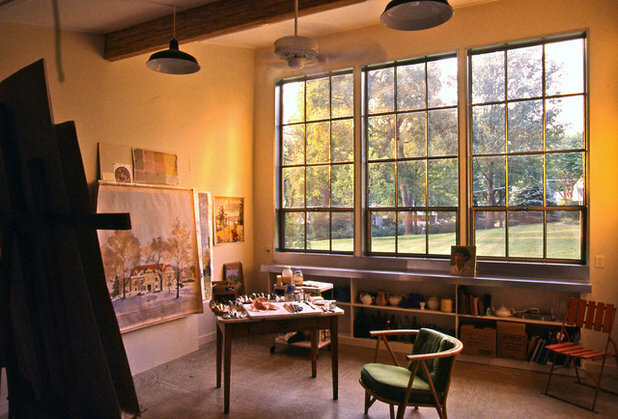 Well, a library is relatively easy — lots of wall space and very little natural light — but an artist's studio is a bit trickier, bringing in considerations of surface and light but also ventilation, exterior access and so forth. 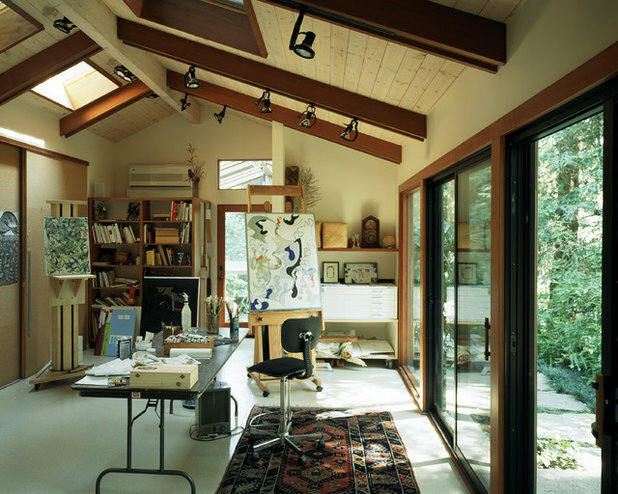 This ideabook looks at some artist's studios to see what should be thought of when building one into your house, be it for pottery, painting or some other medium. Let's say the artist is a painter. 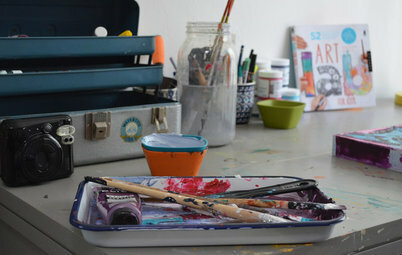 Ideally a painter's studio would be removed from the rest of a house, so that paint does not get on couches, and brushes aren't washed in the same sink where people cook or brush their teeth. 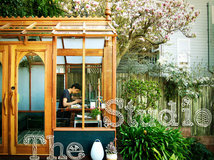 This studio takes that to the extreme by being a 500-square-foot structure separate from the original Victorian house. 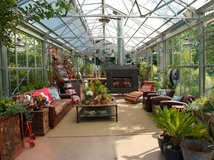 The way the studio opens to the yard is a great feature we'll discuss more later. Traditionally, northern light (in the Northern Hemisphere) was desirable for artist's studios, because the light would be diffuse rather than direct. 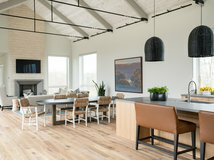 In a sense, this mimics the conditions in galleries and museums, where some indirect natural light may enter the space, accompanied by some artificial lighting. 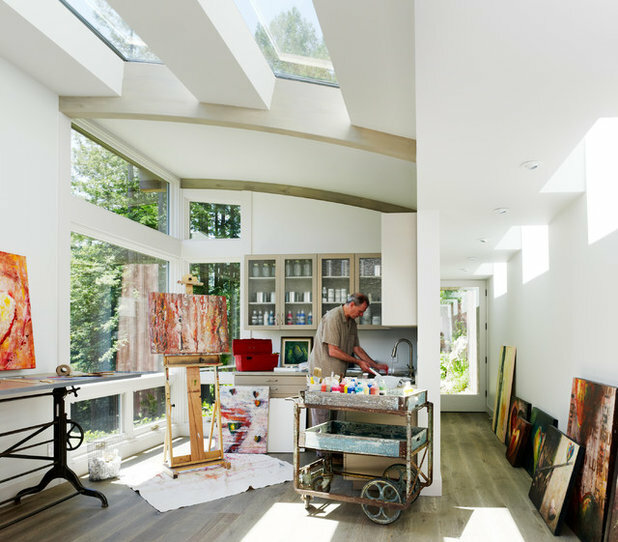 Site constraints mean that studios can't always take full advantage of north light, so maximizing any available light is ideal, such as in the case of this studio with windows and skylights. 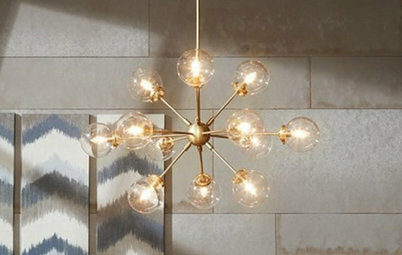 When the location of openings is varied to maximize the daylighting, shades can be used to block direct light when it is not desired. 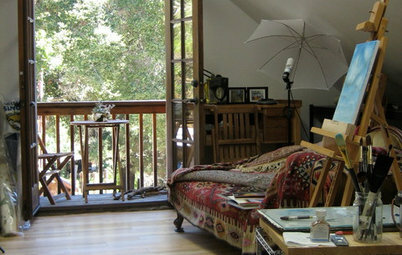 Such is the case with this attic studio. 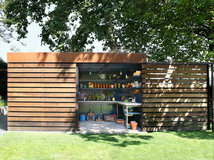 A fairly common way of creating an artist's studio is converting a garage. 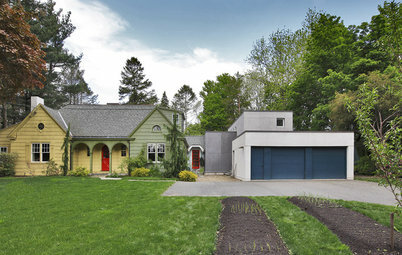 Here, the existing garage door opening allows easy access to the outside. Other adjustments may include adding skylights (I like the way they exposed the beams here), HVAC and drywall on the inside. This studio makes it clear that storage is an important concern. 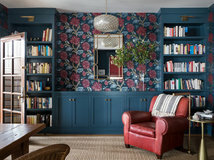 Depending on the art one creates, the height of the space is important. 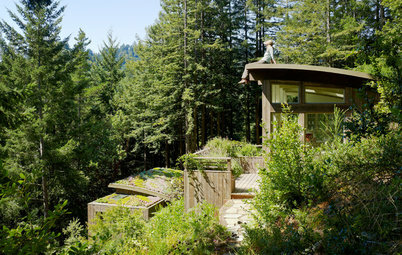 Note in this case how the wall on the left is higher than the exterior wall on the right, owing to it being closer to the peak of the roof. 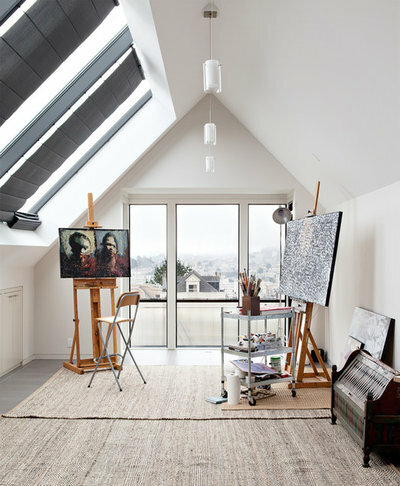 This means that some fairly tall canvases can be set up to take advantage of the extra room. 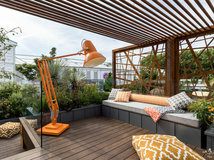 Note also the skylights, the track lighting and the terrace access. 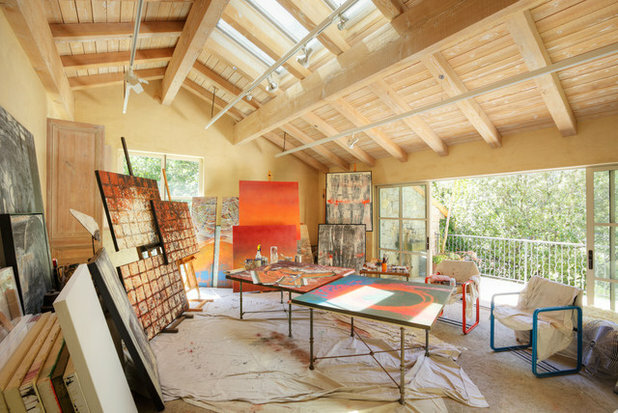 Similar to the previous example, but a little bit more intimate, is this studio with skylights, track lighting and sliding-door access to outside. I'd wager that this generously sized studio faces north. Not only does this glass wall bring in plenty of light, but it frames a dramatic view. I know what I'd paint! I'd also wager that these windows bring in some north light, though a bit western facing, given the sunset making its way in. 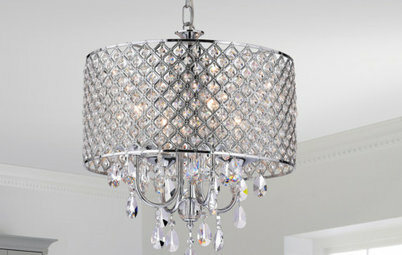 This small studio also includes some pendant lights and a ceiling fan. 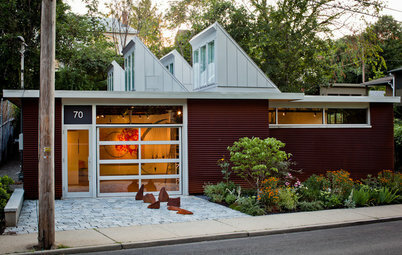 From the outside, we can see the artist's studio's wing on the right. A small chimney exhaust is visible on the exterior wall, maybe for a kiln or another heating supply. 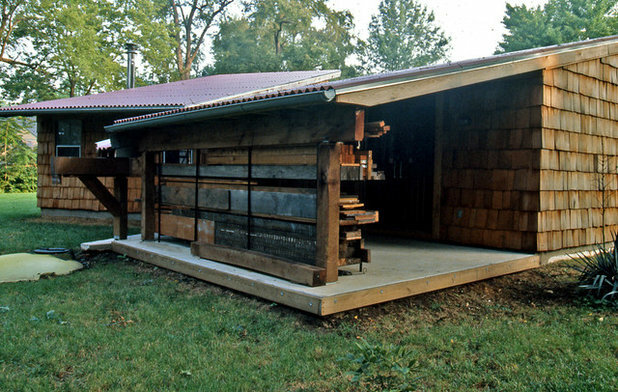 If the former, it points to an important consideration for a pottery studio: how to install a kiln. 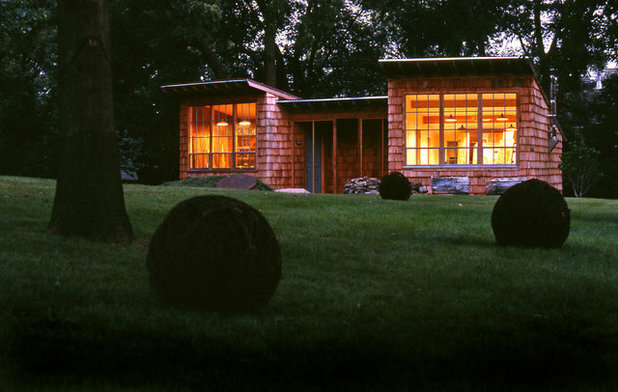 Given the type of fuel and the temperatures it takes to fire ceramics to rock-hard durability, an artist may have some issues installing a kiln at home, depending on the local jurisdiction. My wife trekked to the suburbs to use a raku kiln because it was close to impossible to have one in the city. 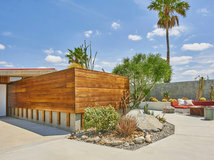 On the other side of the same studio is an outdoor area with some covered material storage — in particular, long planks of wood. 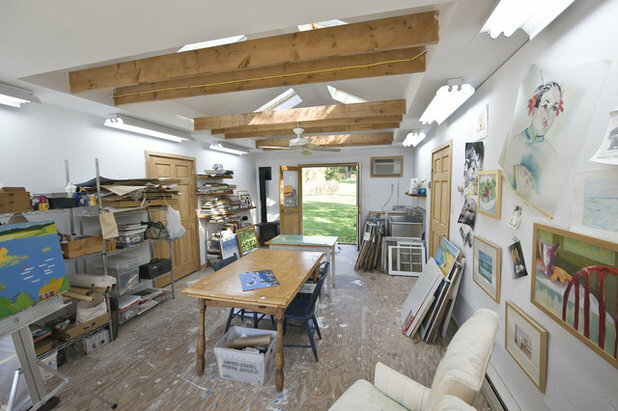 If you're serious about an artist's studio, it's good to think outside the box, if you will, and consider adjacent spaces as well. 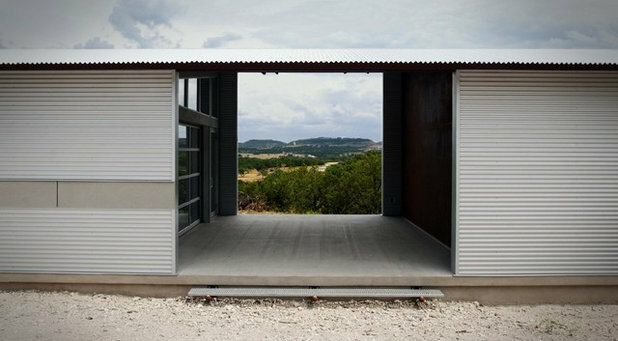 To me, the ideal artist's studio has direct access to an outdoor space that would also be used for making art. 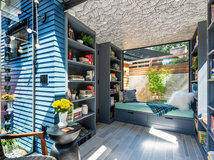 In good weather, this outdoor area could serve as a place to paint, throw pottery, what have you; a connection to nature and the elements is important in making art. 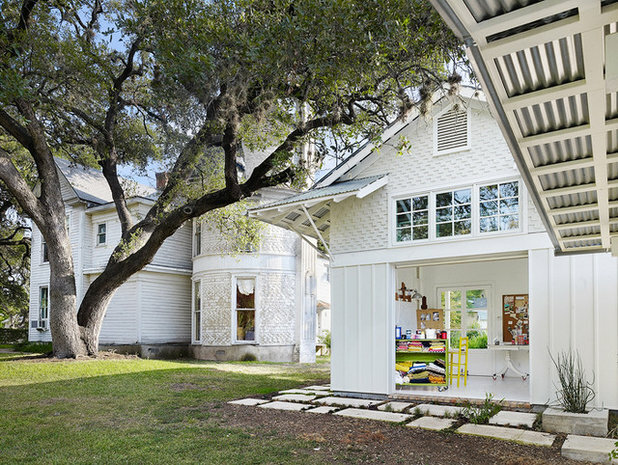 The retractable doors of this garage/shed make this building perfect for working indoors and out. 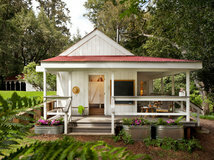 This last example shows that an outdoor space can also be designed into a house for use even in inclement weather. 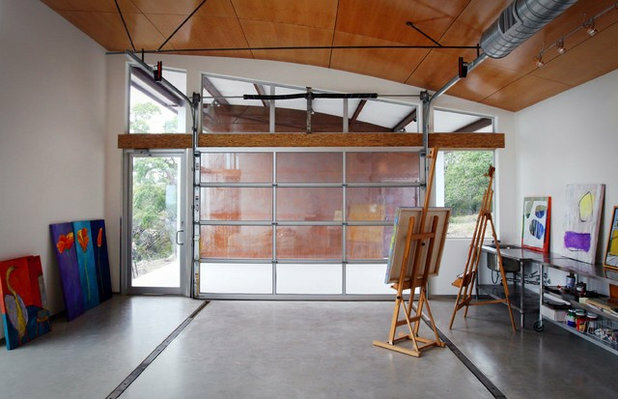 This studio can be extended to the covered space next to it just by opening the garage door, which also has glass for natural light. The view from the outdoor space then becomes like a picture frame, giving the artist plenty of inspiration. zombieknit: A response to your question: "... But why is there an apostrophe in the title?" There is an apostrophe because the word 'artist's' is possessive, i.e. 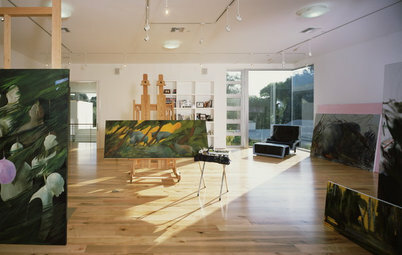 : "the studio that belongs to an artist" = artist's studio. 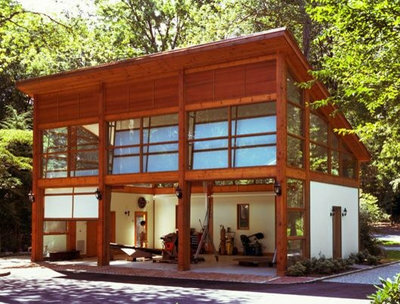 When I build my garage, an artist's studio is going upstairs. I think I'm going to use plywood for the floors, but not sure. I want something durable that I don't care about dripping paint on. 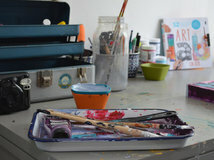 Also, for 'Nancy': having an art studio for me is a designated work area and business office. It is most definitely a need not a whim. Paintings take up room, too. 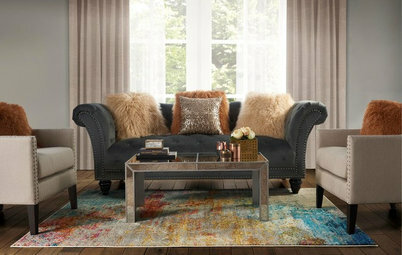 Have to have a lot of area to store them before they are sold, exhibited, and reproduced.